Authorities announced today that they had removed terror suspect Winkie from the women’s cellblock of the county jail and placed him in a maximum-security men’s lock-up, after learning that the defendant is, in fact, male. Prosecutors declined to say how the startling discovery was made. whew, i was a bit worried there about winkie's naughty bits. also, good to know that fatherland times is on the case: "read the fatherland times -- where 'deutcheland uber alles' is more than just a song." 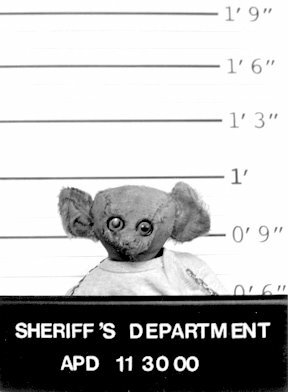 while the free winkie committee affirms naughty bits, we doubt that winkie, as a teddy bear, has any.